Events and Opportunities — SO WHAT ELSE INC.
“Everybody can be great because anybody can serve.” -MLK JR.
Come join So What Else as we partner for our monthly day of service at the Interfaith Works Clothing Distribution Center. Volunteers will be sorting through donations, helping with organizing & item placements, and helping with the overall flow of the distribution center operations. Fill out the form below & join our Interfaith Works Volunteer Team! Come join So What Else as we partner with our dedicated compatriots from An Earthly Embrace for their 3rd annual Purple Laces 5k! 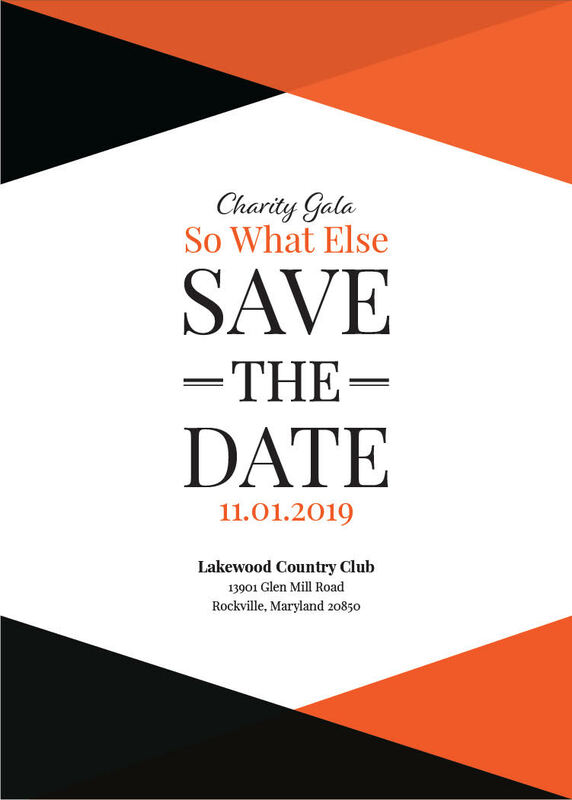 This event supports the mission of An Earthly Embrace- which is to support healing, empowerment and rebuilding of lives that have been impacted by domestic violence. We are looking for volunteers to arrive on-site at 9am, and to help So What Else set-up & run the Snacks and Youth Activities tables. Sign up to volunteer below & we will be back in touch with details soon! 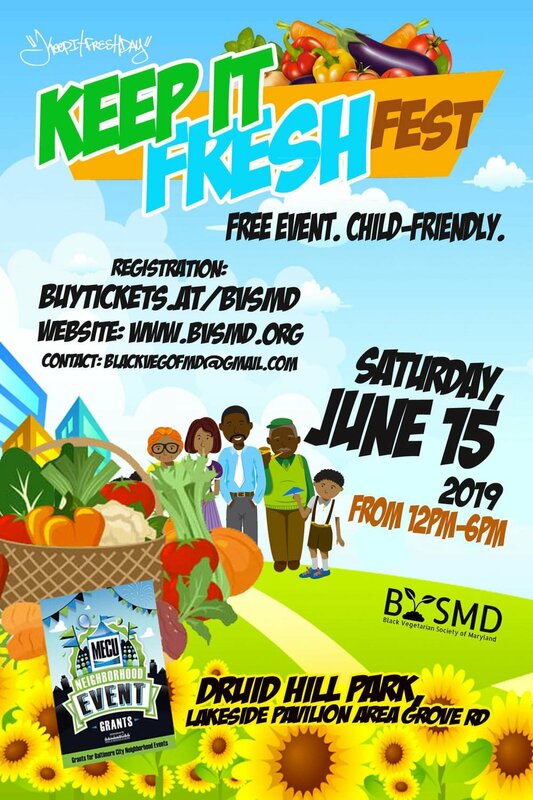 The Black Vegetarian Society of Maryland is hosting a free and child friendly event at Druid Hill Park! Check out the FB event below or register on www.bvsmd.org! We will see you there! STAY TUNED, DETAILS COMING SOON. Fill out form below to request more information! Ask us questions below or RSVP and we will send you over details! On Monday, April 22nd, each of our two Spring Break Camp Locations will be planting trees in celebration of Earth Day. We will be planting: Hazelnut, Elderberry, Butterfly Bush and Azaleas! Our campers at our Silver Spring location will be planting from 10am to 12pm. Our campers at our Rockville Location will be planting from 2pm to 4pm. We are looking for donations of gardening gloves and shovels! To schedule a donation drop off or pick-up please fill out the form below. This will be SWE’s 5th year partnering with The Community Services Foundation, to host over 400 children from Washington DC, PG County, Montgomery County and Howard County to a day sports and fun! We gather our after-school and summer camp youth to come together for a massive day of healthy competition and we need your help! Volunteers are needed to help lead sports stations, assist our staff and help with food and set up logistics. Light refreshments and t-shirts will be provided. This is a great opportunity for volunteer groups, SSL hours available. It truly takes a village to make an event of this size a success. We thank you in advance for your consideration! Sign up below and we will be in touch shortly! So What Else Camp, provided each day of Montgomery County Spring Break, serves 40+ students living in a under-served pocket in the city of Rockville. Sponsor a day of camp for a child! Want to volunteer with youth? Want to donate art supplies or healthy snacks? Fill out the form below to set up a chat with us! So What Else hosts kids and teen programming & lunch, every Saturday @ the Wingate - a community located in SW, DC. We also host monthly community breakfast events, on site, one Saturday a month. If you would like to volunteer your time as a youth mentor please fill out the form below! Make a donation by filling out the form below! We will be in touch shortly! Join our comrades at This is My Brave in Baltimore, MD at the UMBC Theatre Saturday, April 6th, 2019 for a live presentation of essays, original music, comedy and poetry performed by individuals living with―or loving someone with―a mental health condition. Join us! Volunteer spots are filling fast, so sign up while you can as there is only one day with available volunteer positions!!! April 3, 2019. There are two time slots available: 9am-11am or 12pm-2:30pm. Volunteers will rove the busiest areas of the festival and collect recyclables using trash grabbers. Volunteers will also help remove full bags from recycling containers and replace them with empty bags. Gloves, trash grabbers, and a cool shirt will be provided. Come join So What Else as we support our sports comrades Mentoring Through Athletics during their Flag Football Kickoff at the Spring Combine! We need volunteers to help with field set-up, to help referee (see below ***) to help with running rotations, and to help with overall event support. Please sign up below to volunteer or referee! Join us for a March Madness Charity Basketball Tournament where 3rd graders get to raise funds to support our summer camps for under-served youth! The event is sponsored and catered by Fontina Grill! The maximum age is 10 to participate. The games are 5 against 5. Make a donation via CrowdRise. Visit the link, click join & create your own fundraising team or join a team. The team that raises the most funds will be awarded a prize at the game! Or simply visit our donation page to make a donation, make sure to include your name so we know you are participating. 10:30 am: Tip Off - All teams will get at least 2 games in the round robin. Games will be between 20-25 minutes, with a stopped clock in the last two minutes of each game. Each game will have at least one referee, one score keeper and foul keeper. Volunteers needed to help support and make Family Math Night at EMES a success! So What Else staff will be in attendance, leading a STEM station. Volunteers will help with set up and logistics for the evening. SSL hours available for students! Come join So What Else as we join the coalition of community organizers for a Day of Service in honor of Martin Luther King Jr and his legacy. The theme of the day is: Understanding each other through service. Volunteers will be creating recycled/upcycled art & decor to donate to Interfaith Works Distribution Center. Join our volunteer squad or ask questions below! We are hosting a holiday party for the community of Rockville Housing! All of our volunteer positions are closed but we are still accepting donations to make the night a very special one for the families. We are accepting gifts for elementary/middle aged youth, store bought/packaged snacks or desserts (no peanut), holiday lights to decorate the center, juice boxes, bottled water, warm clothes & coats. Please email raeeichner@gmail.com if you have a donation to make before Dec. 21st! Join us for our annual December Community Day - where we collect, sort and distribute in-kind donations to our community sites and partners. We will be collecting donations up until and on the day of the event. We are also looking for volunteers to come out sort & deliver collection items. Sign up, schedule a pick up or ask questions by filling out the form below! Come join So What Else as we return to help our friends from Girls on the Run with their Montgomery County 5k!! All ages are welcome to volunteer with the Cheer Squad; however, all other stations are only open to ages 16 & up. Volunteer are needed to help with: setting-up the course, crazy-hair station, court marshaling, cheer squad, passing out waters/energy snacks, and working the medical tent (18+ for Medical Tent). Register below and please let us know which station you are interested in working. Join us for a community paint day at our local home community center in Rockville, MD! We are giving the center a face lift and putting a fresh coat of paint on the walls. Volunteers are needed! This is a family friendly event- please where proper clothing for painting & light refreshments will be served. The community center is used by youth & families living in the Rockville Housing Enterprise Community. So What Else currently runs free-of-cost, after-school programming from 4:00 to 6:30 pm, Monday through Friday, during the school year. Local veterans will be showing up for the community of Clay Terrace after undergoing a recent tragedy. Volunteers are needed for: Painting, landscaping, constructing seating & storage solutions, and most importantly showing the community that they care. Parking: street parking along Cloud Place NE & 53rd street. Come join So What Else as we help our dedicated community allies furnish 40 brand new apartments for veterans moving out of homelessness! There is no minimum age; however, please be forewarned that this event will include a lot of lifting and carrying items such as: beds, dressers, TVs, lamps, etc. All volunteers will first report to the Boy Scouts Capitol Area Headquarters, located at: 9190 Rockville Pike, Bethesda, MD 20814. From there you will be carpooled, along with the rest of your shift-team, to your post. Which will either be: A Wider Circle in silver spring, or building 50 of Walter Reed. All volunteers are required to fill out a security form which will be provided after their initial registration. Sign up below and we will send you a confirmation email! Come join our volunteer team for our eighth year helping with the Fallsgrove Neighborhood Halloween Parade! Volunteers are needed for: event set up, parade flow, event break-down, and overall event support as directed by our wonderful hosts. This opportunity is open to students seeking SSL hours, and anyone who wants to help and celebrate the festivities! For more information or to sign up, please fill out form below! The government is unresponsive to the needs of today's youth. A new wave of student leaders is emerging, ready to organize, protest, and stand up for their rights. These stories of today's student activists will hopefully inspire others to become the change they want to see in the world. 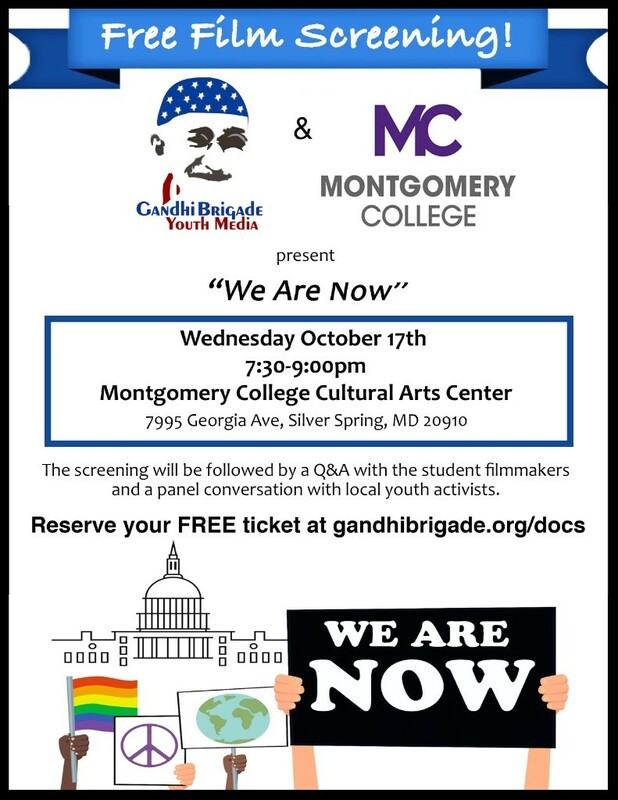 Join the student producers of Gandhi Brigade Youth Media at the premiere of their new short documentary "We Are Now." After the screening the youth producers will participate in an audience Q&A, followed by a panel conversation with student activists from CASA de Maryland, Democracy Summer, Takoma Park Youth Council and Zero Hour, among others. 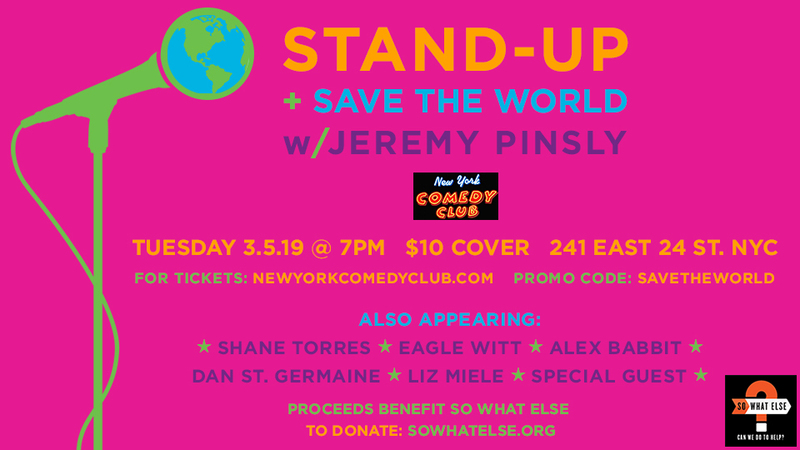 You won't want to miss this special event! The event is free and open to the public. Please forward and share. Volunteers are needed to help prepare food, serve dinner, and wash dishes during this farm-to-table dinner sponsored by Seed Of Life nurseries. So What Else will be helping to remove invasive plants from Greenbelt Park. This volunteer opportunity involves identifying and removing different invasive plants in Greenbelt Park. It is not a difficult or dangerous task. This hands-on volunteer project will take place every 1st Saturday of each month. Come out and help Greenbelt Park work hard to preserve the park for future generations. Please bring insect and/or tick repellent, sunscreen and water. Volunteers are needed in Frederick to assist our food recovery parter from Seed of Life nurseries, with their field/farm project! Sign up below! Let us know how many people are coming in the message section, see you there! Join our volunteer team in preparing Harlem Parks inner block parks for the fall and winter. We will be trimming trees, removing weeds, picking up trash and other fall cleanup activities with the Baltimore City Department of Parks and Recreation and The Baltimore Green Network. We’ll be meeting on the 1200 block of W. Lafayette Avenue (south side of the street) and we would love to have you join us. Dawson's Market: Cheers for Charity! Benefitting So What Else! Join us at our favorite local market for an evening of wine, cheese and community! 100% of proceeds go towards our free Fall After School Youth Programming! Mamma Lucia Grand Re-opening and So What Else Fundraiser! Join us on September 20th and October 4th to celebrate the grand re-opening of Mamma Lucia's Falls Grove Location! Mamma Lucia is hosting a fundraiser, all day, where 20% of all proceeds will be donated to to support our free After School Programming for youth. Guests must say they are there to support So What Else! If you can't make it to the Falls Grove location, all Mamma Lucia restaurants will be taking part, dine in and carry out! Come out and check out the beautiful renovations and help us fund our fall season of programming for local youth. **September 20th is now Carry Out Only due to delay in renovations. October 4th is carry out and dine in, for the official re-opening!